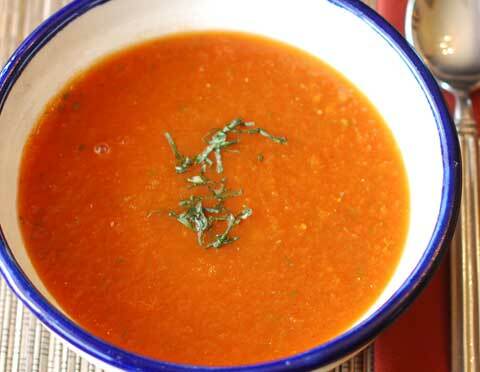 Tomato soup was one of my favorites when I was growing up in New England. Even Campbell’s soup, with plenty of saltine crackers, was good. However, made with fresh tomatoes and basil, this soup easily surpasses anything available in a can. It is also easy to make. This is one of the soups I regularly eat during the winter months. I love soups in winter. Heat a saucepan of water on the stove until it comes to a rapid boil. Cut a shallow “X” through the skin on one end of each tomato. Pierce a tomato with a fork (usually through the stem end) and plunge into the boiling water. Hold it beneath the surface for 10 to 15 seconds to loosen the skin. Set aside to cool. Repeat with the other tomatoes. Peel and chop the tomatoes. If you prefer, you can cut them in half through the middle and squeeze out the seeds. Some cooks like to strain the seeds, adding the liquid to the tomatoes and discarding the seeds. Place tomatoes, shallot, sugar, tomato paste, white balsamic vinegar, and stock in a large pot. Bring to a boil, cover, reduce the heat to low and simmer 30 minutes. Add two tablespoons of the chopped basil. Purée in a blender (let the soup cool first) or in the pot (still hot) using an immersion blender. Season with salt and pepper. To serve, reheat gently without boiling. Optional: Bowls of the soup can be garnished lightly with a little chopped fresh basil before serving. If you believe this recipe is worth having, please consider making a donation toward this web site's maintenance by using the following button. Thank you.